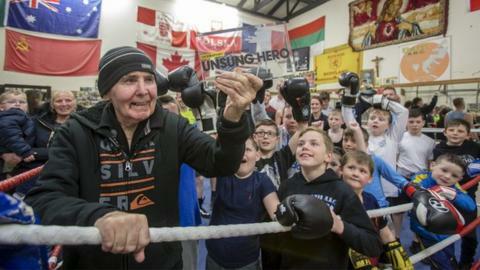 A veteran boxing coach from Coatbridge, Lanarkshire, has won this year's BBC Get Inspired Unsung Hero award in Scotland for his work to develop the sport at grassroots level. Members of the Barn Boxing Club nominated Rab Bannan for his unstinting work across more than four decades. Bannan will compete against winners from other parts of the UK in Belfast for the overall honour at the BBC Sports Personality of the Year event. "I love it and I live it," he said. "Boxing is not about violence, it's a whole culture. You fall in love with it, you can't get away from it." Bannan, who is in the club eight hours a day, five days a week and also on Saturday mornings during the boxing season, has developed numerous district, national and British champions - and world champions Lawrence Murphy and Ricky Burns. His coaching has produced more junior champions than any club in Europe and in the 1990s his fighters won nine national titles in a single championship event, a feat that has not been surpassed by any club since. Colin Sharp, who helps to run the club, said that Bannan is seen as much more than a boxing coach in the community. He is recognised by councillors, police officers and the community at large as a positive influence on generations of young people in the town. Sharp said: "The word legend is used a lot, but in this case it only comes close to describing the man who has dedicated more than 40 years of his life to the club, the sport and the local people of Coatbridge. "Rab is more than a coach - he is a father figure to many, a social worker, role model and friend. "He works tirelessly to educate kids to better themselves and use their energy positively, regardless of race, religion, colour or gender." Bannan, pointing to the children surrounding him at the Barn club, told BBC Scotland: "The award shouldn't be given to me. I'm the past, these guys are the present. "It's the laddies that make it and it's all the coaches who are the backbone of the club. We're a team." Part of the Barn legend is that no-one knows Bannan's age. "I like to keep myself fit," was all he would say on that front. "I do two hours' training every day. I train to live. "You've not just got to look after yourself for you - it's for the people who love you. You are entitled to do something about it. "You don't have to come into a boxing club to actually fight; you can come in and learn how to look after yourself by using the fitness equipment and by listening to the trainer about a healthy lifestyle. "I've had guys come in here who are on a self-destruct path. I tell them to tone it down and behave. Sometimes that can bring them on and they become active members of the club." Ewan Angus, head of sport at BBC Scotland, said: "Congratulations to Rab. He is a thoroughly deserving winner of the award, not just for his expertise as a coach, but also for the support he has given out of the ring to so many local people over the years. "The Unsung Hero Award aims to place the work of people like Rab firmly in the spotlight, demonstrating the valuable work they carry out encouraging people across the UK to take up sport. "Good luck to Rab as he goes for overall UK award for Get Inspired Unsung Hero for 2015 at the BBC Sports Personality of the Year Awards, which will be broadcast live on BBC One on Sunday 20 December from the SSE Arena in Belfast."